Η ειδικά βαμμένη Camaro που ετοίμασε η Chevrolet για την ομάδα βετεράνων στρατιωτικών “Achilles Freedom Team of Wounded Veterans” δημοπρατήθηκε για $175.000 το περασμένο ΣΚ κατά την διάρκεια της δημοπρασίας Barrett-Jackson στη πόλη Scottsdale της Αριζόνα. Όλα τα χρήματα πήγαν στην ομάδα Achilles Freedom Team η οποία βοηθά τραυματίες βετεράνους να ξεπεράσουν τα τραύματα που απέκτησαν κατά την διάρκεια των πολέμων, μέσω αθλητικών προγραμμάτων. SCOTTSDALE, Ariz. – A special Military Tribute Camaro sold to an internet bidder for $175,000 Sunday during the final hour of the Barrett-Jackson auction. 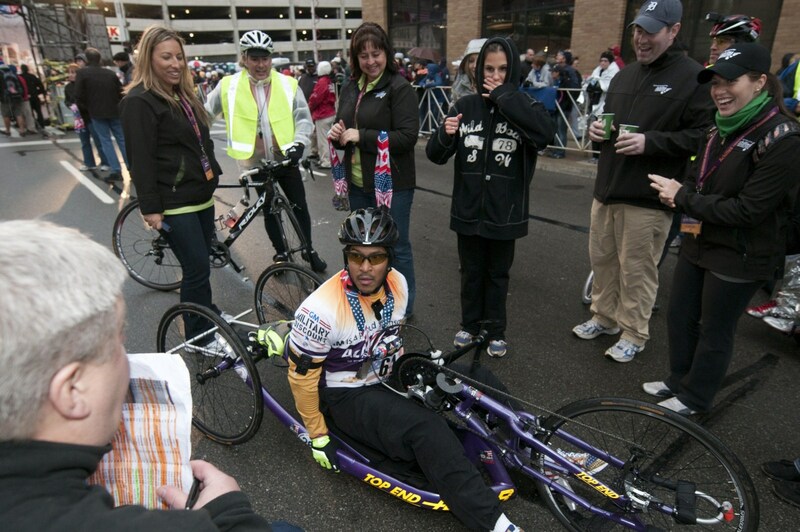 The money will help support the Achilles Freedom Team, which helps wounded veterans of all services overcome their injuries through athletics, including marathons. With four members of the Achilles Freedom Team on the stage and several military personnel cheering from the audience, bidding quickly soared to six figures, then gradually climbed to the winning $175,000. Before heading to Scottsdale, the car toured 30 military bases across the country, as well as the Pentagon. While introducing the 2010 Camaro SS on Sunday, award-winning artist Mickey Harris, whose airbrush designs adorn the car, joked that it was the only car that “burned rubber” in a Pentagon tunnel. 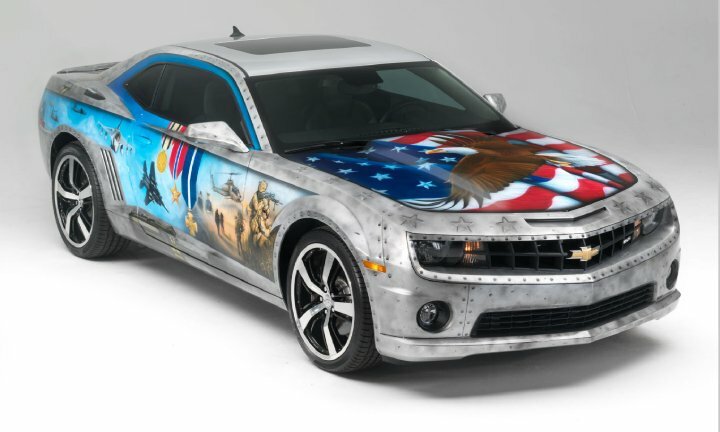 “The Military Tribute Camaro was designed to honor our armed forces heroes. 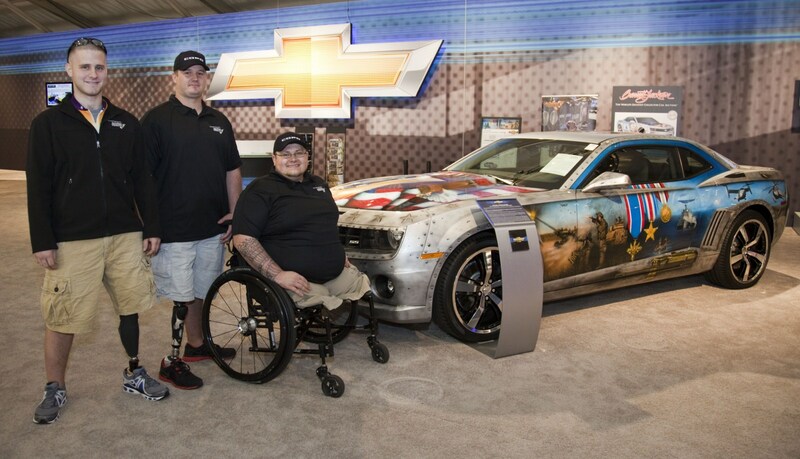 Now, thanks to its generous new owner, it will help our injured veterans rebuild their lives through the excellent work of the Achilles Freedom Team,” said Chris Perry, vice president, Global Chevrolet Marketing and Strategy. 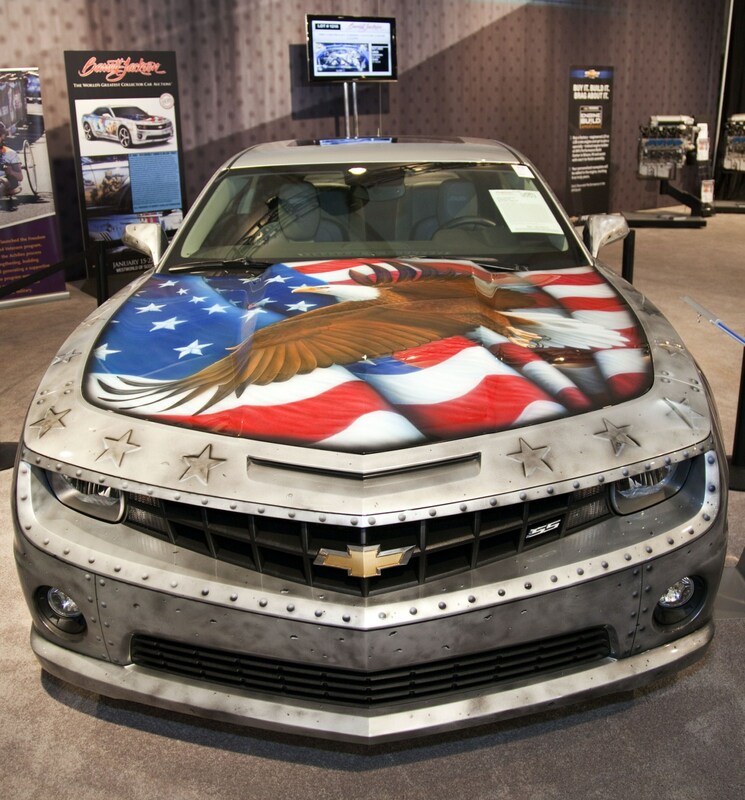 The Military Tribute Camaro was commissioned by the GM Military Discount program. It represents all five branches of the armed forces (Army, Navy, Marine Corps, Air Force and Coast Guard) and some of the military’s highest individual awards and current campaign medals. Its designer, Harris, grew up on military installations. He has been airbrushing for 33 years and has an extensive portfolio of military art that has earned him worldwide acclaim. Sunday’s Camaro wasn’t the first to be auctioned to benefit military programs. Last June, a first-off-the-line, 2012 Honor and Valor Limited Edition Camaro SS sold for $100,000 at a Barrett-Jackson auction in Orange County, Calif., with the sale proceeds going to the Cell Phones for Soldiers program. 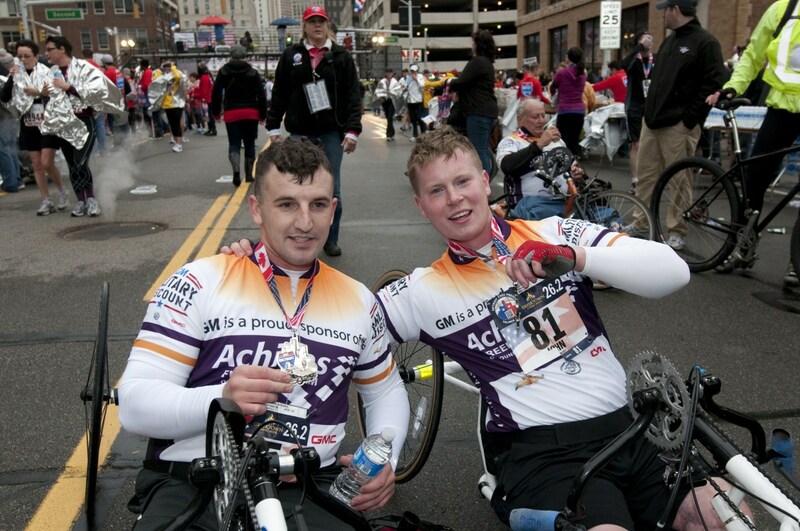 Achilles Freedom Team of Wounded Veterans: In 2011, Chevrolet underwrote a portion of Achilles costs for participating in the Los Angeles, Boston and Detroit marathons, as well as other events. Chevrolet also has donated a Silverado HD truck and 20 hand cycles to the team. GM Military Discount Program: Considered the most generous military discount program in the industry, GM offers GM Preferred Pricing (the same price extended to GM suppliers) on any Chevrolet (except Volt), Buick or GMC. On Jan. 19, Staff Sgt. Brian Nagy of Columbus, Ohio took delivery of a 2012 Chevrolet Cruze LTZ in the program’s Red White and Cruze Sweepstakes. In 2011, Chevy Silverado, Cruze and Camaro were the most popular vehicles sold. Cell Phones for Soldiers: This program provides phone cards to service men and women. In 2011, Chevrolet raised $212,000 (worth 100,000 hours of talk time) from the auction proceeds of a 2012 Honor and Valor Camaro SS and Chevrolet donations of $100 for every car and truck sold during Military Appreciation Month in May. Since 2010, Chevrolet has collected more than 70,000 used cell phones, worth 70,000 hours of talk time. Travis Manion Foundation: The GM Foundation provided $250,000 to this foundation that assists veterans and the families of fallen heroes. Its namesake is First Lt. Travis L. Manion, killed in 2007 in Iraq by sniper fire while defending against an enemy ambush. Chevrolet also sponsors special activities throughout the year for active and retired military members and their families.